Installation shot, MIAD's "Style, Innovation, & Vision: Six Perspectives of a Design Collection" exhibition. Photo by the author. Don’t answer that. Most jokes beginning that way aren’t very nice to the subject. My answer, in this case, is: six. This fall, the Milwaukee Institute of Art & Design (MIAD) Director of Galleries Mark Lawson asked six design-lovers to curate an exhibition in the college’s Brooks Stevens Gallery. Style, Innovation, & Vision: Six Perspectives of a Design Collection (Oct 7, 2011 – March 1, 2012) shows the results of his experiment. 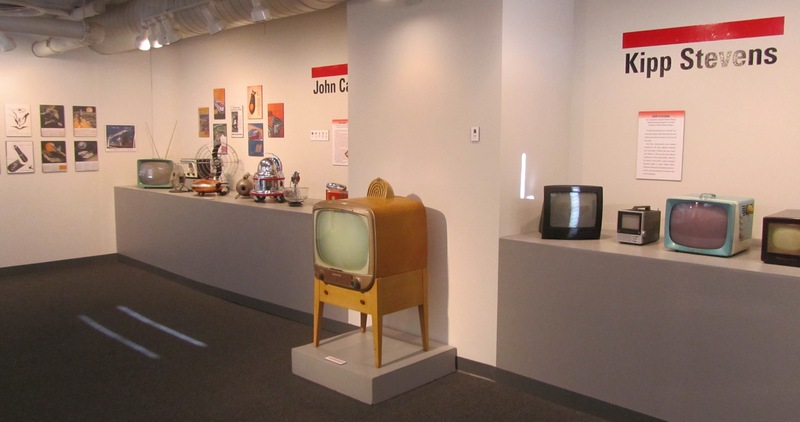 MIAD has a significant collection of industrial design objects–ranging wildly from a Betty Crocker mixer to wheelchairs to a Motorola Razr cell phone. In 2010 MIAD’s webmaster Dave O’Meara and MIAD alumnus Dave Hinkle created a new digital catalog of these objects and illustrations. To celebrate and advertise the possibilities of this new resource, Mark Lawson used it at the center of an exhibition. He called in a variety of voices to help, and I was thrilled to be one of the six involved. Screen shot of MIAD's design collection digital catalog. As I scrolled through hundreds of images of MIAD’s collection, I was delighted to see familiar objects, intrigued to see unfamiliar designs, and stunned at the limitless ways these could be combined in an exhibition. What would we all select? TIME magazine cover, June 6, 1960. MIAD, Grassl Collection. Perhaps because the material was unfamiliar to me, I was drawn to a collection of mid-century TIME magazine covers illustrated by Boris Artzybasheff (American, b. Ukraine, 1899-1965), like the one at right. Artzybasheff included a variety of art and design influences—from Surrealism to Post-Modernism—and made those visual aesthetics relate to the social issues and politics contained within the covers. Could I continue his witty visual relationships into physical objects from MIAD’s collection? I tried, and had fun doing it. 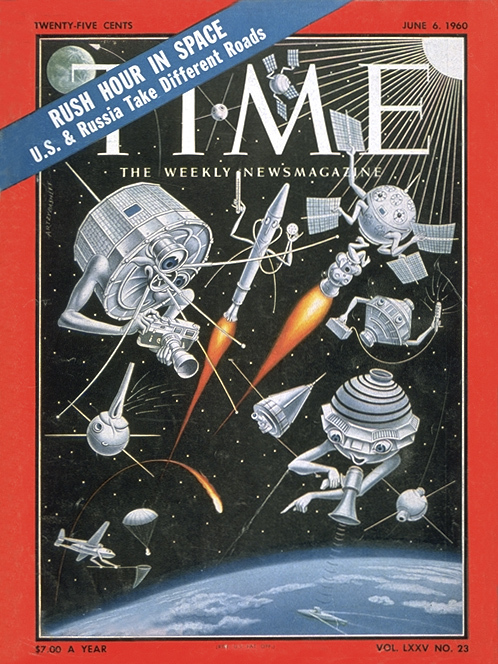 For instance, this June 1960 cover showed cartoon-like space vessels, illustrating the article “Rush Hour in Space: U.S. and Russia take Different Roads.” Within the MIAD collection images in the digital catalog, I found contemporary everyday objects there were a veritable celebration of missiles and spaceman helmets (see image below). We expect that TIME magazine would discuss the Cold War space race, but isn’t it fascinating that this obsession carried over to an ice bucket that looks like moon-landing equipment? I continued this game by pairing a 1964 TIME cover celebrating the plastic advancements by the DuPont Company with Bakelite, vinyl, and plastic objects. A 1957 cover shows a repairman facing off against a variety of anthropomorphized household machines, with those same machines shown right in MIAD’s gallery. 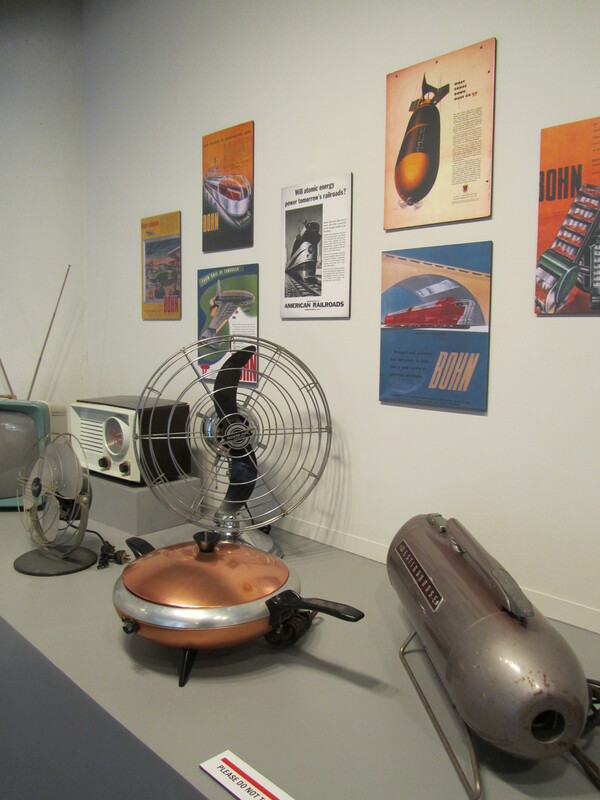 Installation shot showing a grouping of space-theme objects (1952 Rembrandt TV antennae, a ca. 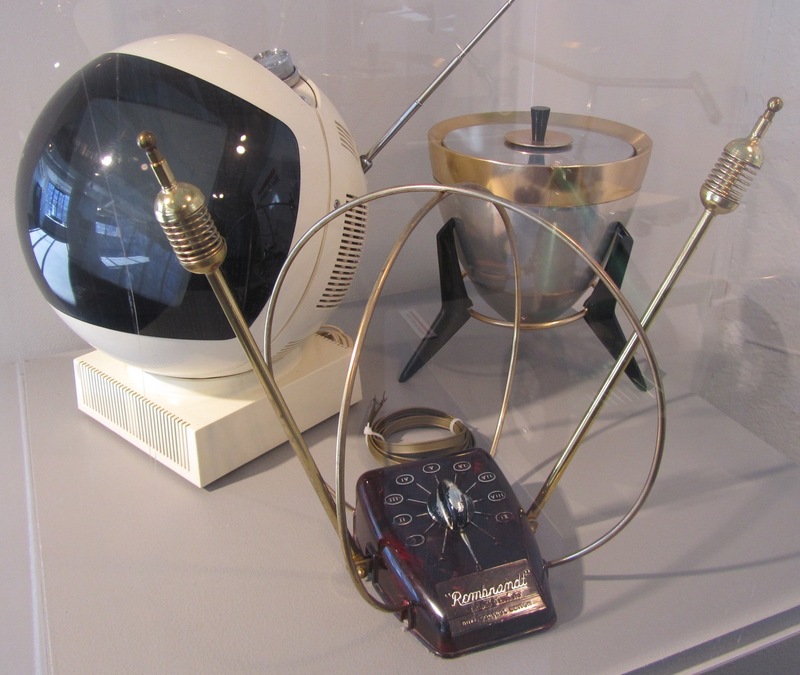 1950 ice bucket, and a JVC Videosphere model 3240 television) in MIAD's "Style, Innovation, & Vision: Six Perspectives of a Design Collection" exhibition. Photo by the author. What was most interesting about the exhibition, of course, is the variety of ways that six individuals approached the selection of objects. We came from a variety of backgrounds–design teachers, practitioners, historians, etc. Miller High Life Lamp, MIAD Collection. Richard Wright, renowned Chicago-based auctioneer who focuses on 20th-century design artifacts, focused on the idea of “Aspirational Design”, finding objects that function in a pragmatic sense, but that also have the ability to mentally transport the user from the realm of the everyday. 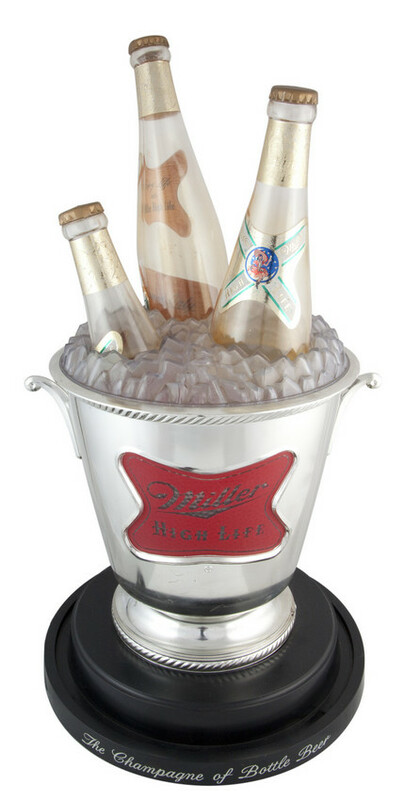 For instance, Wright’s installation included the Miller High Life Lamp, that is, the elevation of an everyday lager to the “Champagne of Beer”. Kipp Stevens, son of legendary designer Brooks Stevens, talented industrial designer and retired president of Brooks Stevens Design, selected a variety of communication devices. He pointed out that these products were considered modern in their day, and that the distinctive styling of these televisions, radios, and telephones was the designer’s formula for successful products just like the iPhone of 2011. John Caruso, industrial designer and MIAD Professor, created a dazzling array of advertisements and related products. He explored futuristic visions of technology and optimism is the post-WWII era. Installation shot showing part of John Caruso and Kipp Stevens selections, MIAD's "Style, Innovation, & Vision: Six Perspectives of a Design Collection" exhibition. Photo by the author. Vicki Matranga, author and design historian for the International Housewares Association, researched deeply into the back story of each product. She included rich information on small text panels that uncovered user, technical and market issues that the given designer sought to resolve. Installation shot showing Ryan Ramos's installation, MIAD's "Style, Innovation, & Vision: Six Perspectives of a Design Collection" exhibition. Photo by the author. Ryan Ramos (MIAD ’07 Industrial Design alum), Lead Industrial Designer at GE Healthcare, curated the collection based on the experiences and expectations a person had when they interacted with a product. 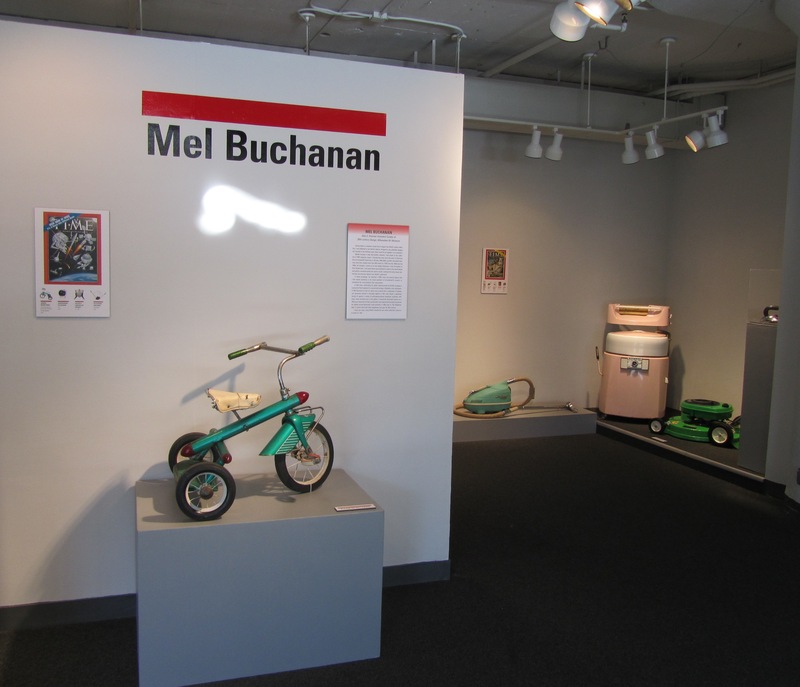 Installation shot showing Mel Buchanan's installation, MIAD's "Style, Innovation, & Vision: Six Perspectives of a Design Collection" exhibition. Photo by the author. I was thrilled and honored to be asked to represent the Milwaukee Art Museum curatorial department in this exhibition at MIAD. I think the resulting installation is not only a great way to view hundreds of design objects from their collection, but to contemplate the multiple meanings these objects have to us today. By showing six different approaches to “curating” the objects, the exhibition essentially offers justification for the collecting of our material past. These tricycles and vacuum cleaners can teach us about children and housework, aesthetics and style, production and manufacture, and even aspiration and dreams. What are the objects we use today that should be stashed away for future historians and designers and students to contemplate? Style, Innovation, & Vision: Six Perspectives of a Design Collection is on view until March 1, 2012 in MIAD’s Brooks Stevens Gallery at 273 E. Erie Street in Milwaukee. Regular gallery hours are Tuesday through Saturday, 10am-5pm. Admission is free. This entry was posted in Art, Curatorial and tagged 20th century art, Art Installation, Behind the Scenes, Brooks Stevens, Decorative Arts, Design, Events, Exhibitions, MIAD. Bookmark the permalink.